Asparagus is unusually rich in folic acid, which is good for your heart and it contains an antioxidant to quell harmful free radicals. Bulgur wheat provides energy, fibre and B vitamins. Crab is a low-fat source of protein. Trim off the tough bases of the asparagus spears and place them in a saucepan. Lay the tips of the asparagus on top of the trimmings to keep them out of the water (the tips will cook more quickly than the stem bases). Add just enough water to cover the stem bases, then boil for about 15 minutes until tender. Pierce with the point of a sharp knife to test. Drain and rinse under a cold tap to prevent them cooking further. Place the bulghur wheat in a saucepan with the boiling water and boil for 10 minutes or until the grains have swelled and are tender. Drain if necessary. Grate 1 tsp of lemon and add it to the bulghur wheat mixture with the olive oil. Season to taste. 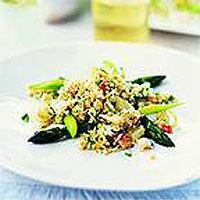 Stir in the flaked crab and arrange it on a plate with the asparagus. Serve with walnut bread or ciabatta.